The gecko tail is an intriguing body part in the animal world. Some species of geckos, including leopard geckos, have a defense mechanism that allows them to "drop" their tails when they feel threatened. This tail loss may occur for a number of other reasons as well and tends to be more common in younger geckos. Fortunately, gecko tail loss is a natural phenomenon, and your pet should come through it just fine. While its tail is growing back, however, there are a few things you can do to ensure it does so in the healthiest way. Why Do Geckos Lose Their Tails? You might be surprised by a tail drop when you try to grab your gecko by the tail or hold it too tightly when it's trying to escape. The detached tail will wiggle and twitch on the ground as though it were still connected to the gecko's body. While this can be shocking the first time you see it, it's important not to panic. Losing a particular body part is a defense mechanism called autotomy that many animals use. Gecko tails are specifically designed to drop: Inside the tail is special connective tissue that creates a location where it can readily break off when needed. When this happens, the blood vessels to the tail constrict and very little blood loss occurs. This is helpful to remember if you're trying to determine whether your gecko dropped its tail or lost it due to trauma; very little blood is lost when the tail is dropped. 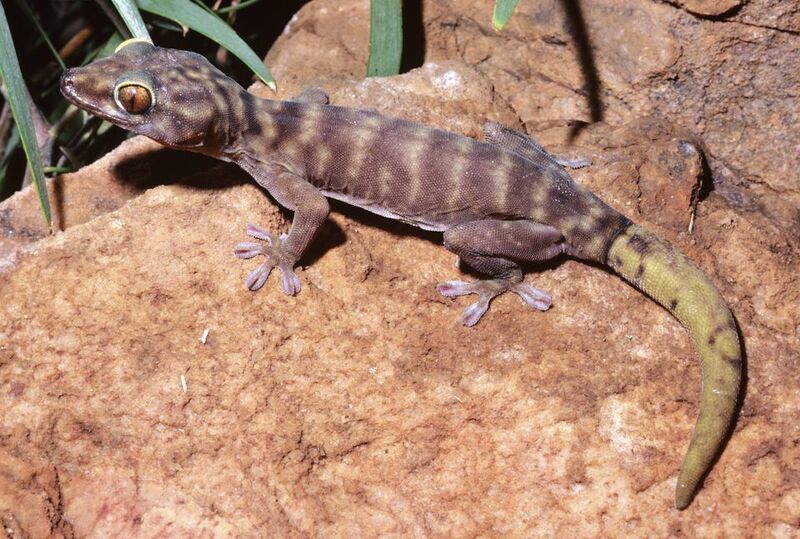 Eventually, a gecko regrows its tail but it may not look exactly the same. The new tail is usually shorter, colored differently, and blunter at the end than the original tail, but this may vary from species to species. Though it's a natural process, tail dropping puts stress on a gecko and may impact its health. For this reason, it's important that you look at the circumstances that led up to it so you can try to avoid these problems in the future. In the wild, a gecko's tail loss serves a very good purpose. The tail's movement distracts potential predators and allows the gecko to get away, leaving the predator with nothing but the wiggling tail. In comparison, geckos are relatively safe in captivity. It's possible, however, for geckos in a group to bully one individual, which could trigger the defense mechanism. If you have more than one gecko in an enclosure, it's a good idea to separate the potential victim from the others, ideally before it loses its tail. Whether it's a little too curious or just got caught in the wrong place, it is possible for a gecko's tail to get stuck or trapped by something in its enclosure. Whenever you set up a new enclosure, try to avoid very tight places and any potential falling objects that can harm your gecko. Both stress and fear can accompany the feeling of being threatened or bullied, but they can separately affect your gecko as well. Loud noises, bright lights, or other startling stimuli, for example, can impact your gecko's well-being and potentially lead to tail dropping. Additionally, the environmental conditions of the gecko's enclosure can be a source of stress that could lead to tail loss. To help keep your gecko at its healthiest, maintain its temperature and humidity in the optimal range. If no other cause can be found for your gecko's tail drop, it may be due to an illness or infection. Whether the infection directly affects the tail area or the loss is a stress-related symptom of an unrelated illness, it's best to call your vet. Use paper towels instead of bedding after your gecko drops its tail. Loose bedding can get into the body where the tail was attached and lead to infections. Switching the substrate to paper towels until the tail is regrown can help keep this wounded area clean. Change the paper towels often to maintain cleanliness. Isolate a gecko that drops its tail from other geckos. The other geckos may harass the tailless gecko even if they've always lived peacefully together. Watch the tail stump for signs of infection. Consult your exotics vet if there's any swelling, redness, or discharge at the site of the tail loss. Evaluate the environmental temperatures and humidity to make sure the conditions in your gecko's enclosure are ideal. Tail loss and regrowth are stressful for a gecko, and you'll want to make sure its enclosure is as comfortable as possible during the healing process. Make sure your gecko is eating well. After the loss of a tail, you can increase the amount of food you normally feed your gecko since the stress can deplete its fat storage. However, make sure that any crickets and other prey items that are not eaten within 15 minutes are removed from the tank as they may try to nibble on your gecko's tail wound. Maintain an ideal environment: Ensure your gecko enclosure is regulated and provides the ideal temperature, light, and humidity to promote good health and reduce any stress on your pet. Keep to a regular cleaning schedule and avoid placing objects in the enclosure that may injure your gecko. It's a good idea to periodically do a safety check as well. Separate geckos: If you have more than one gecko, you may need to separate them. This is particularly true if you notice any aggressive behaviors. Minimize handling: Geckos don't normally enjoy a lot of handling, so it's best to keep it to a minimum. This can reduce the risk of your accidentally pulling your gecko's tail off. Handling is a good way to socialize your gecko and makes moving it easier while you're cleaning its enclosure, but too much can be stressful. Even under ideal conditions and with proper handling, you can't be in complete control. It's always possible that your gecko may drop its tail despite your best efforts.